Summertime means that it is officially strawberry season! Since strawberries are one of my favorite fruits, I try to incorporate them into as many things as possible. Salads, smoothies, oatmeal and of course, desserts! 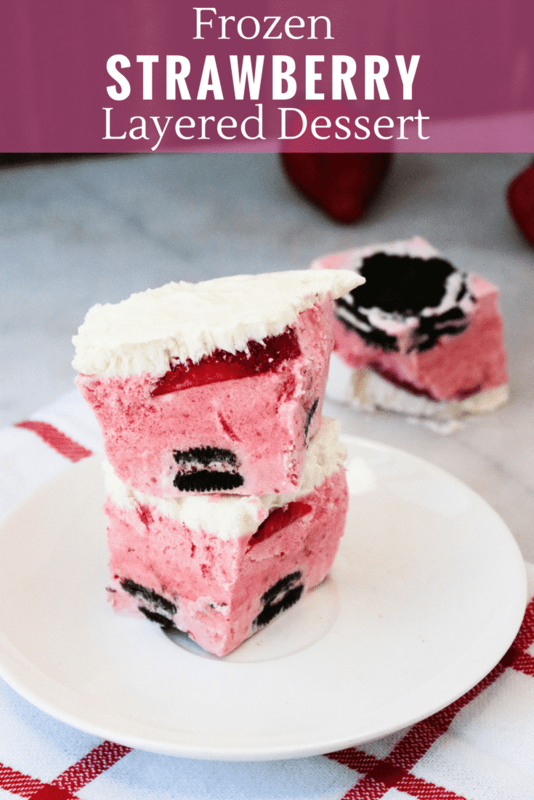 This Frozen Layered Strawberry Dessert is so yummy, and is a perfect summer treat. You’ll be making it over and over again! Strawberries and vanilla almond milk are blended together, then mixed with whipped topping and poured over a layer of chocolate sandwich cookies. And for the perfect finishing touch, a deliciously creamy layer of cream cheese, whipped topping and powdered sugar is spread over the top. 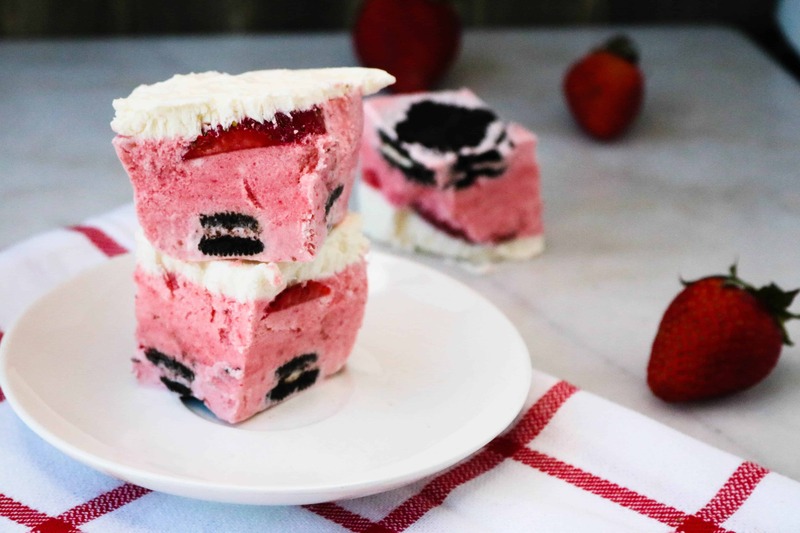 Each serving (1 square) of Frozen Layered Strawberry Dessert is only 157 calories, so you can feel guilt-free when you eat two (or more!) squares. With just 7 ingredients, this treat is so easy to make that you’ll be able to put it together in no time! It’s a cool and refreshing dessert that is perfect for any meal, but it’s especially great for those summertime backyard barbecues. Tip #1: For softer cookies, leave the dessert in the fridge longer than the specified 4 hours to allow the cookies more time to soften. Tip #2: To make it a fun and patriotic dish for your 4th of July celebration, decorate the top with sliced strawberries and blueberries. 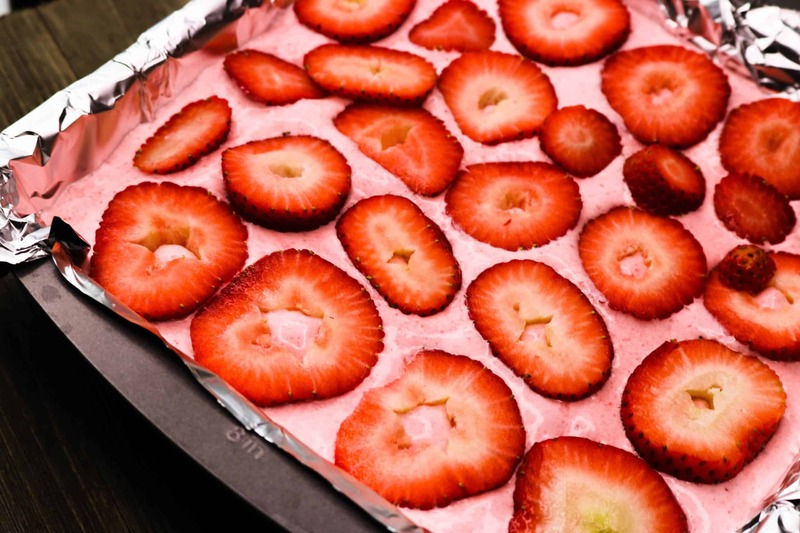 Tip #3: When lining your 8×8 pan, using a parchment paper sling will make removing your finished Frozen layered Strawberry Dessert from the pan a breeze! This technique also works great for brownies, sheet cakes, quick breads, and any other treats baked in a square or rectangular pan. Step #1: Line an 8×8 baking dish with aluminum foil or parchment paper. 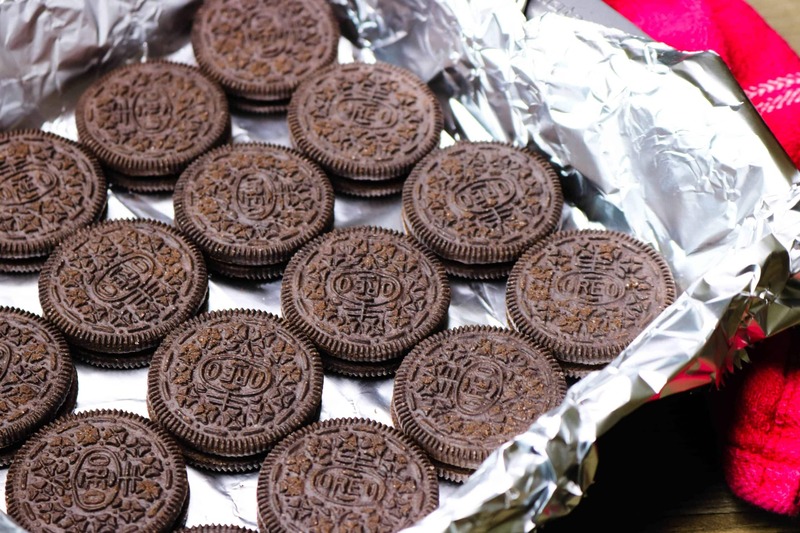 Arrange cookies in a layer on the bottom of the pan. 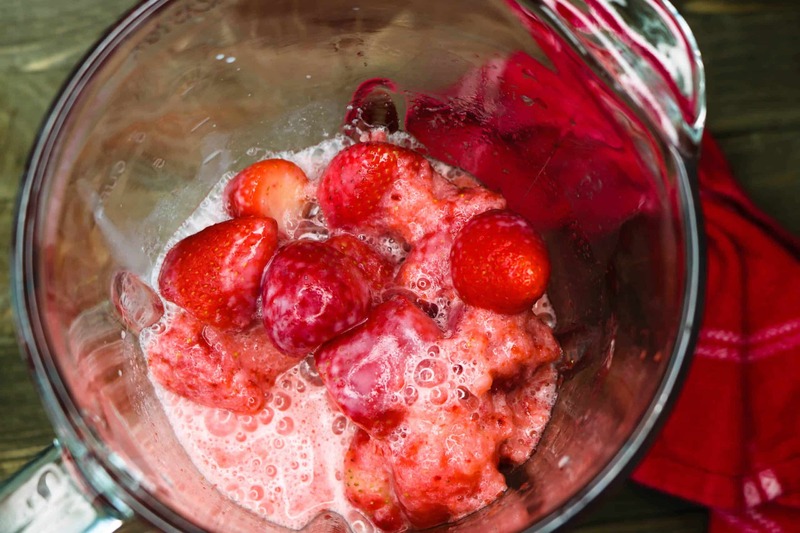 Step #2: Mix together strawberries, lemon juice and almond milk in a blender. 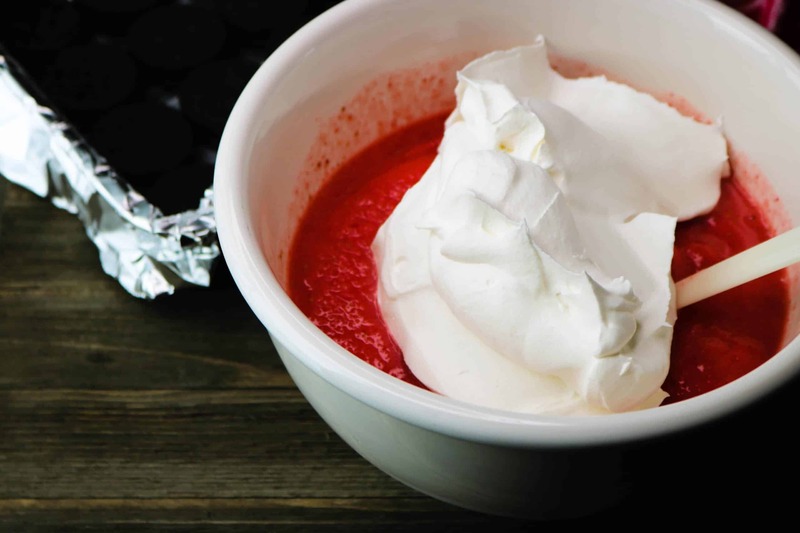 Pour into a mixing bowl and fold in whipped topping. Scrape from bowl and pour over the cookies, and then place in freezer and let set for 30 minutes to an hour before adding the next layer. Cream together cream cheese with the powdered sugar until smooth. Add in the lemon juice and continue mixing. Incorporate the cool whip and blend until just mixed. This Hazelnut Cheesecake Layered Icebox Cake is an absolutely delicious coffee-flavored dessert. Inspired by the ingredients of banana pudding, this Banana Cream Dessert is made with graham crackers instead of wafers. So tasty! Who says kids get to enjoy all the desserts? This Boozy Frozen Strawberry Daiquiri Pie is the perfect grown-up dessert you’ve been looking for. 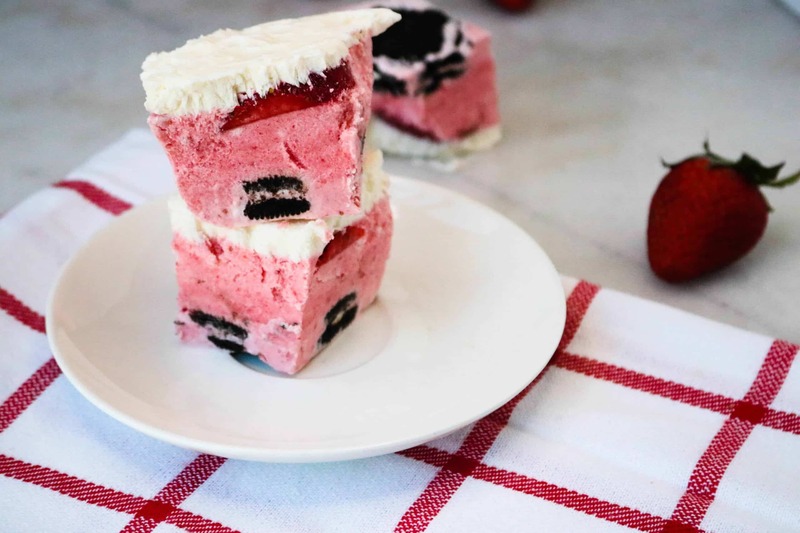 Delicious frozen layered dessert that combines strawberries and chocolate cookies. Line an 8x8 baking dish with aluminum foil or parchment paper. Arrange cookies in a layer on the bottom of the pan. Mix together strawberries, lemon juice and almond milk in a blender. Pour into a mixing bowl and fold in whipped topping. Scrape from bowl and pour over the cookies, and then place in freezer and let set for 30 minutes to an hour before adding the next layer. Cream together cream cheese with the powdered sugar until smooth. Add in the lemon juice and continue mixing. Incorporate the whipped topping and blend until just mixed. Spread the second layer out over the top of the strawberry layer and then freeze for at least 4 hours before serving.